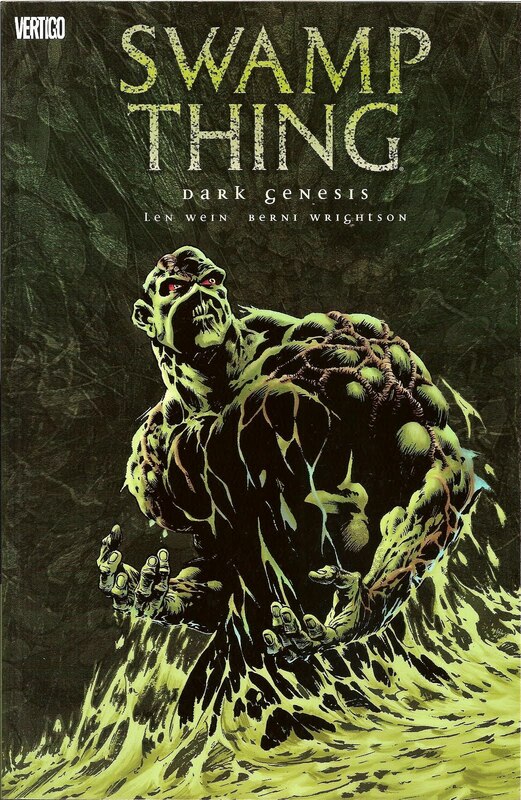 While I remember watching the '80s Swamp Thing films, I became a fan when the live-action TV series and short-lived animated series debuted. I wasn't really aware of the comics then, I was mostly into the big superhero comics like Superman and Batman, anyway. Of course, along with the animated series, fans were treated to a tie-in toyline that was quite popular back in the day. I really loved those figures, my favorite being the "Snare-Arm" Swamp Thing. Well, I think that was his name. 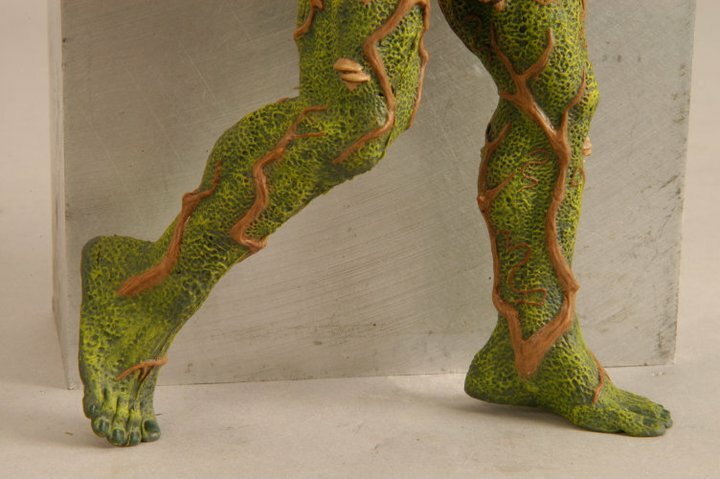 Anyway, his right forearm would extend on a "vine", squeezing his legs together would make the vine retract. I also had "Camouflage Swamp Thing" which you can see thanks to this review by Novelty. You may think I'm going off on a tangent here, but I wanted to point out Swamp Things great, albeit short, toy history. 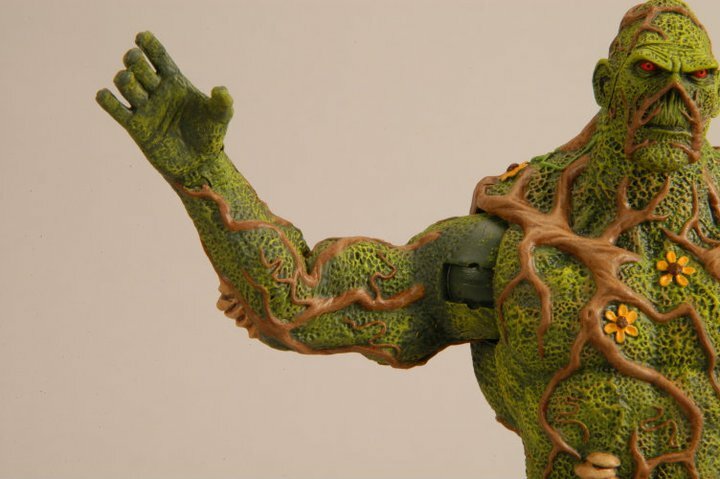 And really since then fans have been left empty-handed in terms of Swamp Thing toys. I know DC Direct released a figure several years ago, but to me it looks more like a statue than an action figure. With Mattel's upcoming release, we have an oppurtunity to own a unique action figure that I think will turn out pretty great. Mattel has billed their Swamp Thing as having "endoskeletal" articulation, meaning the articulation is inside the figure. This sounds pretty cool to me and looks promising in the pictures. I'm sure making ST an exclusive was always part of the plan, but they took advantage and introduced something new to the line that will just add to the uniqueness of the character. I'm still on the fence about his size, though. I believe in a recent Q&A, Toy Guru or Matty (Is there a difference?) stated that he would be about 9" tall. That's significantly larger than your average DCUC figure and more in line with a Collect-and-Connect figure. I mean, ST should be big, but at 9" he friggin' huge! I guess it'll really depend on how he looks in-hand, when I place him next to Superman, or The Demon. I wonder if he was ever considered as a C&C... At least we don't have to buy an entire wave to own him! 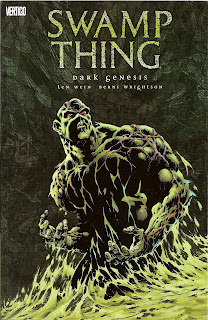 As far as the sculpt goes, they seem to have been inspired by the version in the first issues of Swamp Thing, depicted above is the cover for that collection, "Dark Genesis". Although the flower bits seem more like something out of Alan Moore's later run on the title. The main difference between the two versions being the width of ST's neck. Later depictions of Swampy featured a wide neck, forming a pyrimid with his head, as seen in the live-action TV series. I'm cool with this version, flowers and all, especially since Mattel, or rather the Four Horsemen, incorporated brown tree branches throughout his body. 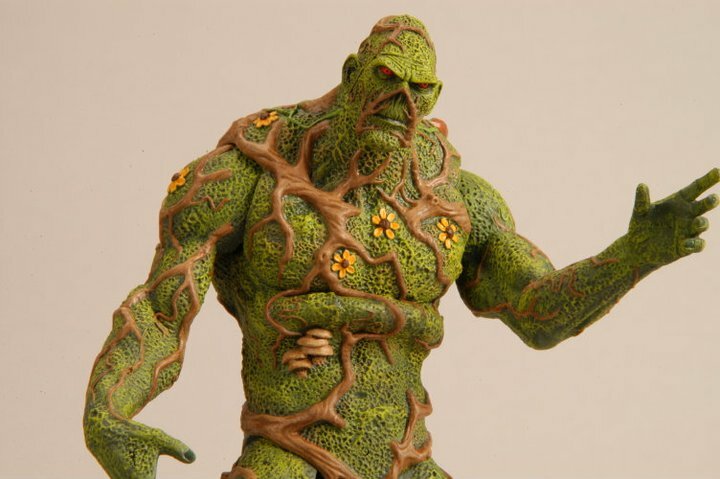 I'm very eager to add this dude to my DCUC, nay... my action figure collection, so August can't get here soon enough. The packaging looks really cool, featuring a detailed outer box, alá last year's SDCC exclusive, Plastic Man, with the inner clamshell doubling as a Swamp Thing mask and he'll even include a display base! SDCC-goers will get the added bonus of a couple of Un-men figurines. For more pics and info check out Matty's facebook page.